"Mum, come and see this," Zachary whispered. He took his mum’s hand and led her to the side of the house. 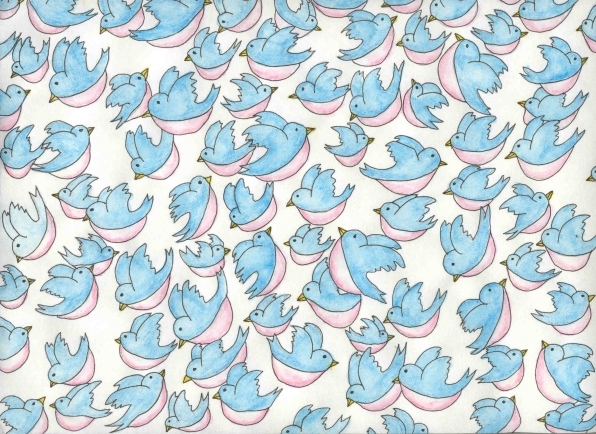 "Look at all the bluebirds." Dozens of bluebirds perched on the white picket fence behind their house. "They’re beautiful," Mum said. "Where in the world did they come from?" "I don’t know, but watch this," Zachary said. "He reached into his pocket and threw a handful of birdseed into the air. The bluebirds flew from the fence, swarming around the seed. Some caught it in mid-air. Other’s waited until the seed landed on the grass. "That’s amazing. Can I try?" Mum asked. Zachary handed her some seed. She threw it high into the air. Bluebirds zoomed here and there, trying to get the seeds before they fell. "They’re noisy," she laughed, covering her ears. They chirped loudly as they fought over the seed. "This is fun, Zachary." He smiled and nodded his head. He tossed a few more handfuls on the grass and then went back to the front of his house. "That’s a lot of birds. I hope Mrs. Mills’ cats don’t see them, or hear them," Zachary said. Mum thought about all the bluebirds in her back garden. "Maybe we shouldn’t feed them anymore. Let’s go and shoo them all away." They went into the back and just about that time, several of Mrs. Mills’ cats came outside. They spotted the birds. "Look, Mum. Cats!" Mum watched in horror as the cats crept up on the bluebirds. They were about to pounce when Zachary started to shout. He ran towards the birds, waving his arms and shouting, "Go away birds!" The birds flew high into the air and landed in the branches of the nearby trees. "At least the cats can’t get them now, not unless they climb the trees. The birds will see them before they get too high." "Feeding the birds is fun, and it was amazing to see all those bluebirds, but I think it’s best we don’t encourage too many to come at once. There are too many cats around this neighborhood," Mum said. The next day Zachary built several bluebird houses and hammered them to the trees, up high, out of the cats reach. He filled them with seed every morning. He was able to watch the bluebirds. The cats weren’t too happy with him, but the birds were safe.